The revolutionary New York Provincial Congress of local representatives assumed the government on May 22, 1775, declared the province the " State of New York" in 1776, and ratified the first New York Constitution in 1777. During the ensuing American Revolutionary War the British regained and occupied New York Town in September 1776, using it as its military and political base of operations in British North America,   Though a British governor was technically in office, much of the remainder of the upper part of the colony was held by the rebel Patriots. 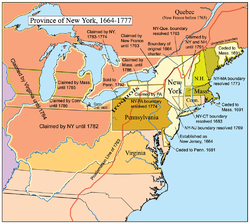 British claims in New York were ended by the Treaty of Paris of 1783, with New York establishing its independence from the crown. The final evacuation of all of New York by the British Army was followed by the return of General George Washington's Continental Army on November 25, 1783 in a grand parade and celebration. In 1617 officials of the Dutch West India Company in New Netherland created a settlement at present-day Albany, and in 1624 founded New Amsterdam, on Manhattan Island. New Amsterdam surrendered to Colonel Richard Nicholls on August 27, 1664; he renamed it New York. On September 24 Sir George Carteret accepted the capitulation of the garrison at Fort Orange, which he called Albany, after another of the Duke of York's titles. The capture was confirmed by the Treaty of Breda in July 1667. The first governor Richard Nicolls was known for writing " The Duke's Laws" which served as the first compilation of English laws in colonial New York. Nicholls returned to England after an administration of three years, much of which was taken up in confirming the ancient Dutch land grants. Francis Lovelace was next appointed Governor and held the position from May 1667 until the return of the Dutch in July 1673. A Dutch fleet recaptured New York and held it until it was traded to the English by the Treaty of Westminster. A second grant was obtained by the Duke of York in July 1674 to perfect his title. A colonial Assembly was created in October 1683. New York was the last of the English colonies to have an assembly. The assembly passed the Province of New York constitution on October 30, the first of its kind in the colonies. This constitution gave New Yorkers more rights than any other group of colonists including the protection from taxation without representation. On November 1, 1683, the government was reorganized, and the state was divided into twelve counties, each of which was subdivided into towns. Ten of those counties still exist (see above), but two ( Cornwall and Dukes) were in territory purchased by the Duke of York from the Earl of Stirling, and are no longer within the territory of the State of New York, having been transferred by treaty to Massachusetts. While the number of counties has been increased to 62, the pattern still remains that a town in New York State is a subdivision of a county, similar to New England. Upstate New York was the scene of fighting during the French and Indian War, with British and French forces contesting control of Lake Champlain in association with Native American allies. Sir William Johnson, 1st Baronet, and other agents in upstate New York brought about the participation of the Iroquois. The French and their Indian allies laid siege to Fort William Henry at the southern end of Lake George in 1757. The British forces surrendered to the French, but many prisoners were then massacred by the Indians. Some prisoners had smallpox, and when Indians took the scalps to their home villages, they spread a disease that killed large numbers. In the end the British won the war and took over all of Canada, thereby ending French-sponsored Indian attacks. One of the largest impressment operations occurred in New York City in the spring of 1757 when three thousand British troops cordoned off the city and impressed nearly eight hundred persons they found in taverns and other gathering places of sailors. New York City was the centre for privateering. Forty New York ships were commissioned as privateers in 1756 and in the spring of 1757 it was estimated the value of French prizes brought into New York City was two hundred thousand pounds. By 1759, the seas had been cleaned of French vessels and the privateers were diverted into trading with the enemy. The ending of the war caused a severe recession in New York. In April 1775, the rebels formed the New York Provincial Congress as a replacement for the New York Assembly. News of the battle of Lexington and Concord reached New York on April 23, which stunned the city since there was a widely believed rumor that Parliament was to grant the colonies self-taxation. The Sons of Liberty led by Marinus Willett broke into the Arsenal at City Hall and removed 1,000 stand of arms. The armed citizens formed a voluntary corps to govern the city with Isaac Sears's house the de facto seat of government and militia headquarters. The crown-appointed New York executive council met on April 24 and concluded that "we were unanimously of the opinion that we had no power to do anything." The British troops in New York City never left their barracks. The British governors were upper class aristocrats not trained in the law, and felt unduly constrained by the legalistic demands of the Americans. In the period from the 1680s to about 1715 numerous efforts were made to strengthen Royal control and diminish legal constraints on the power of the governors. Colonial lawyers fought back successfully. An important technique that developed especially in Boston, Philadelphia and New York in the 1720s and 1730s was to mobilize public opinion by using the new availability of weekly newspapers and print shops that produced inexpensive pamphlets. The lawyers used the publicity medium to disseminate ideas about American legal rights as Englishmen. By the 1750s and 1760s, however, there was a counter attack ridiculing and demeaning the lawyers as pettifoggers. Their image and influence declined. 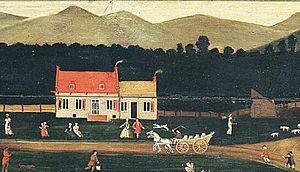 The lawyers of colonial New York organized a bar association, but it fell apart in 1768 during the bitter political dispute between the factions based in the Delancey and Livingston families. For the next century, various attempts were made, and failed, in New York state to build an effective organization of lawyers. Finally a Bar Association emerged in 1869 that proved successful and continues to operate. The American Revolution saw the departure of many leading lawyers who were Loyalists; their clientele was often tied to royal authority or British merchants and financiers. They were not allowed to practice law unless they took a loyalty oath to the new United States of America. Many went to Britain or Canada after losing the war. . The fur trade established under Dutch rule continued to grow. As the merchant port of New York became more important, the economy expanded and diversified, and the agricultural areas of Long Island and the regions further up the Hudson River developed. Fishermen also made a decent living because New York was next to the ocean, making it a port/fishing state. Inland, farming crops made farmers a lot of money in the colony. Tradesmen made a fortune selling their wares.